This issue is all about Pris and Cole! Yay! Just like the Special! Well, not exactly. First off, they’re not teaming up on a mission. Secondly, while Cole’s part of the story is totally “A Day in the Life of Grifter,” the Pris story is a story of the girl’s history, hopes, and dreams. It’s two stories happening at the same time, and either one would’ve been an awesome full issue, but it was fun to see them unfold side by side. In our first story, Void takes on a mission to help our gal Pris. So Pris is still knocked out from that Daemonite attack several issues ago. She’s not coming out of her coma, so the best thing to do is put her in some crazy sci-fi contraption to link her brain to Void’s, you know, for easier brain access. Comic books everybody! As Void tours Pris’s mind she finds it divided up into various rooms. In the first, she sees Pris’s background as a dancer of various types, only thing is, Pris isn’t hiding in this room. Void moves to the next to see Pris and Spartan fighting twisted versions of the rest of the team. Void joins in the fight and even takes down her own evil doppelganger. On to the next room and the trio is fighting straight up Daemonites! Finally, there’s one room left, Pris must go there alone and confront her darkness. After all this, both women wake up. End Pris’s story. And, in our final story, Savant’s personal mission is to find King Solomon’s skull. It’s taken her and her pal Mabel all around the world and back to hunt down, and it turns out it’s on an island in the South Pacific. She finds out that she can have the skull if she marries the king of the island. She’s cool with that, as she’s just planning on grabbing the skull, knocking the king out and then flying away with Mabel. Well, not so easy it turns out! See, the king is a gigantic four-armed ape named Loooooth, uh oh! But come on, it’s Savant! She manages to get the skull, bop Magilla on the nose and catch her flight. But before she and Mabel can start high-fiving they find that there’s a gremlin on the plane’s wing! Womp-womp! During Pris’s story, Void finds an encoded memory (or meme, before that word became hijacked and lost all meaning) that fills in how Pris is part Kheribum and part Daemonite. It was a Daemonite experiment to create life, so their evil scientists mixed the blood of each race, twenty thousand souls and then let it bake for 15 days. Out popped the man who would one day lead us to Pris, and as it turns out, he turned on his creators. He’s no friend of Daemonites either. We’ll see Pris’s ancestor again, but not until the “WildC.A.T.s Annual” issue 1, which doesn’t even occur until after “WildC.A.T.s” Vol. 1 issue 50! That’s a long wait for a return Mr. Voodoo’s Grandpappy! For all seriousness, after looking at the cover and reading the book, how badass would it’ve been for Pris to always have a lightsaber? So awesome, right? I’m not going to lie, I usually forget when the hell Pris got hurt. 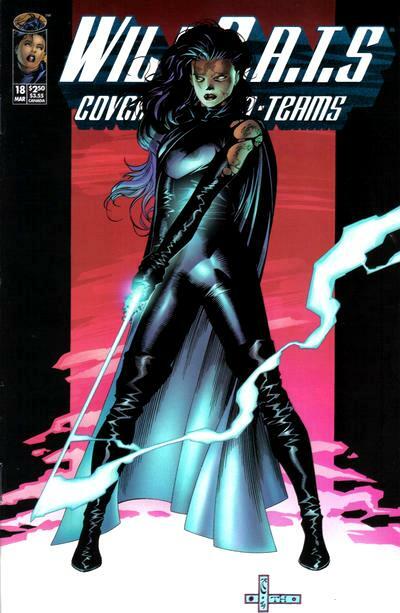 Even reading “WildC.A.T.s” on its own I usually have to pull up issues going backwards until I re-encounter those first few pages of issue 15. I know there’s no possible way for it to be true, but I’d like to think that Looooth arrived on the South Pacific island to rule after he escaped the island of gigantic monsters from “Planetary” issue 2. There’s nothing that contradicts that, and Looooth does have 4 arms, he could probably swim pretty well. Hey, it’s still in the Pacific, just a little further South and warmer, I’m not ruling it out! 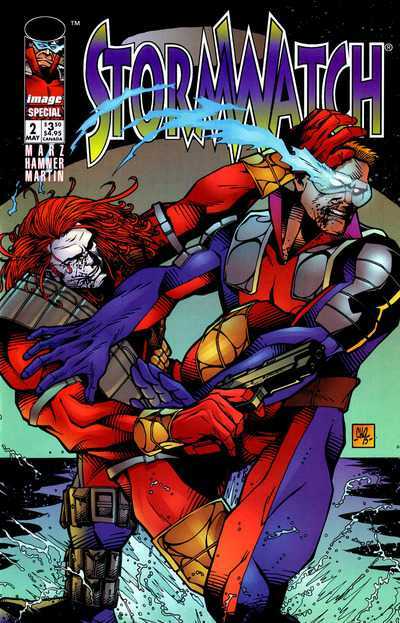 NEXT : “Backlash” issues 6 and 7 by Brett Booth, Jeff Mariotte, Sean Ruffner, Dan Norton, Melvin Rubi, Chuck Gibson, Sandra Hope, Edwin Rosell, and Tim Townsend.